was born to a musical family in Moscow in 1978. He received his first violin lessons from his mother at the age of four, and at the age of ten began his formal studies at the Central Music School in Moscow with Evgenia Tchugaeva. In 1991, Sorokov moved to Vienna and became an Austrian citizen in 1996. He graduated with honors from the Vienna University of Music and Performing Arts in March 1994, where he studied with professor Dora Schwarzberg from 1991. In 1996 he was selected on a scholarship to participate in the Isaac Stern Workshop in Verbier, Switzerland. From an early age, Anton Sorokov has performed with renowned orchestras such as the Vienna Symphony Orchestra, the Berliner Symphoniker, the Nuremberg Philharmonic Orchestra, the Nuremberg Symphony Orchestra, the Bayerische Kammerphilharmonie, the Vienna Concert-Verein, the Philharmonia Orchestra London, the Montpellier Symphony Orchestra, the Kärntner Symphony Orchestra, Sung-nam Philharmonic Orchestra, the Kharkov Philharmonic Orchestra, Janàcek Philharmonia Ostrava, the St. Petersburg Academic Symphony Orchestra and the Moscow Symphony Orchestra. 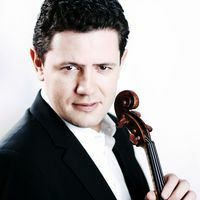 As a soloist, Sorokov has worked with renowned conductors of the likes of Fabio Luisi, Mstislav Rostropovich, Myung Whun Chung, Bertrand de Billy, Ulf Schirmer, Lior Shambadal Philippe Auguin and Alexander Shelley. The violinist has appeared in large music halls around the world – the Golden Hall of the Vienna Musikverein, the Vienna Konzerthaus, the Liederhalle Stuttgart, Tokyo’s Suntory Hall and Bunka Kaikan, as well as the Great Hall of the Moscow Conservatory. Sorokov’s appearance with Montserrat Caballé before an audience of 5,000 in the Arcade of Gostiny Dvor in Moscow in 2001 marked a career highlight. In Summer 2007 he recorded famous violin concerts of Bach, Beethoven, Tschaikowsky and Kabalewsky together with the Vienna Classical Players for the Oesterreichische Nationalbank. In addition to numerous other awards, Anton Sorokov received the 1st prize and the Grand Award at the Beethoven Competition in the Czech Republic in 1994 and the 1 st prize both at the Stefanie Hohl Competition in Vienna in 1997 and at the Romano Romanini Competition in Brescia in 1999. From 2003 to 2005, he was first concertmaster of the Nuremberg Philharmonic Orchestra at the Staatstheater Nürnberg. Since 2005, Sorokov has been first concertmaster of the Vienna Symphony Orchestra. Anton Sorokow is also a professor at the University of Music and Performing Arts Vienna since 2011. He has previously been a professor at the Vienna Conservatory ( Konservatorium Wien - Privatuniversität ) from 2008 to 2011. Furthermore, the musician has held several international master classes. Anton Sorokov plays Guarneri del Gesù’s “ex Carrodus” violin, Cremona 1741, on loan from the Oesterreichische Nationalbank.